I love my Specs. Many a times I said I grew into loving them, now I see tem as a fashion accessory. My glasses choices vary every day. Some days, I pick a sharp cat-eye to look fierce. Other times, big thick black frames to look smarter or square frames to look more serious. When I heard about the latest designer collection at Specsavers, my heart skipped a beat. That’s Moschino for a very affordable £125, and even better, on the 2-for-1. The Love Moschino collection, exclusive for Specsavers, counts with 12 super wearable frames for prescription, for all occasions, and 3 prescription sunglasses, but with that cute and irreverent Moschino twist. There are little heart prints, polka dots, tasteful jewels and lettering. They are just the right mix of cool and elegant. 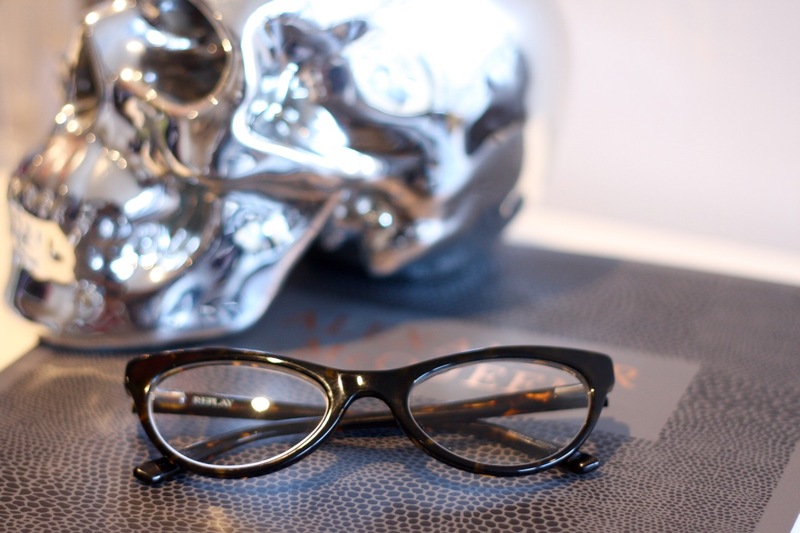 My favourite has to be the cat-eye: black frames with a jewelled detail on the arms. A close second is this gorgeous larger oval-shaped frames with adorable heart on the outside and polka dots on the inside of the legs. There you have it, my 2 for £125. I could, however, also do with this gorgeous plum number and the fabulous white-framed prescription sunglasses. Choosing is a hard task, especially when I tried them all at the amazing Light of Soho which, incidentally, had their art exhibition themed about love. Impossible not to feel enamoured! Best thing? You can get hold of yours now! Browse the oh-so-adorable Love Moschino collection on the Specsavers website and pop to a store for an eye test and quirky new specs! The hard party? Pick only 2! Am I addicted to glasses or what? It looks like I cannot say no to exciting new frames. To be honest, I wear glasses everyday. I don’t wear the same trousers everyday, so it’s fair to have a few pairs to rotate. Right? Superdrug has recently joined the high street opticians game with very competitive options. They launched Superdrug Online Opticians and I recently received my glasses from them, delivery was quick and painlessly. After attending their Christmas press day, I fell in love with some simple big-ish black frames and the rest is history. The total cost of these glasses is £25, which include the 2439 frames, of course, single vision lenses and free delivery! Is that a fabulous value or what? They are pretty simple and unbranded, but have a great fit, are very light and are quite fashionable. Their range include hundreds of frames from £25. There is also a £9 value glasses range. You can get all the details on the Superdrug Online Opticians site. Four eyes, me? More like 24 with my glasses collection, I say! I’ve been a specs wearer for about 10 years now and although my eyesight is pretty good, I must wear glasses for computer work and reading, which happens pretty much all day, every day. Every time Specsavers launches their fashion collections I get rather excited and this time it is no different: at their recent meet the designers showcase in London, I could count at least ten pairs I wanted straight away! My relationship with my glasses has blossomed in the past few years. Forward back to the teenager who wanted to wear glasses but had a perfect vision, than forward to the late-20’s girl who found out she needed glasses for reading/computer and thought it was a sign of getting old, getting the most discreet frames possible, I can say it came a long way. I now love my glasses – and Specsavers really helps me match them to my personality. Glasses are really important – they are on your face every day, but somehow, the thought that goes with choosing them, is usually less than choosing clothes, or shoes that we might wear less often than glasses. And that is why I loved this showcase – it showed glasses as fashion accessories all throughout. 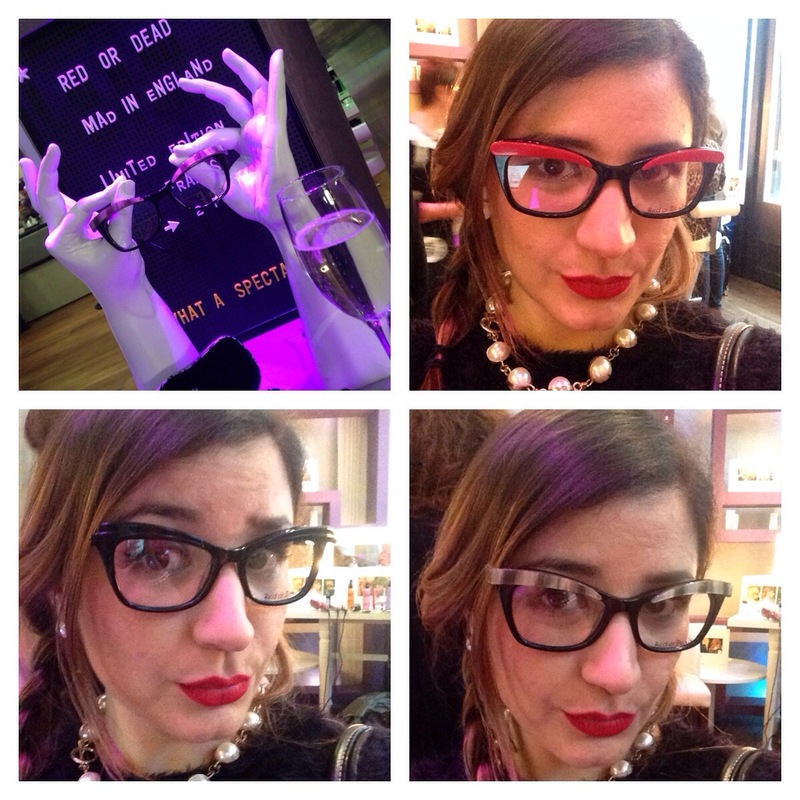 You probably noticed from one of my outfit posts that I am a specs wearer, and I was very happy to be invited by Specsavers to try one of their fabulous glasses and picked a lovely Osiris frame. The glasses mecca is very well-known nationwide and I ended up in their Tottenham Court Road branch, in London. With the specialist help at hand, I was able to pick my favourite frames which then received my prescription lenses (I had an eye test with Specsavers in March anyway, so I didn’t have to have a new eye test). The lovely Laura from Beattie Communications was also there to provide much needed girly advice. I had already decided I wanted cat-eye shaped glasses and wanted to stay away from my always reliable black frames. 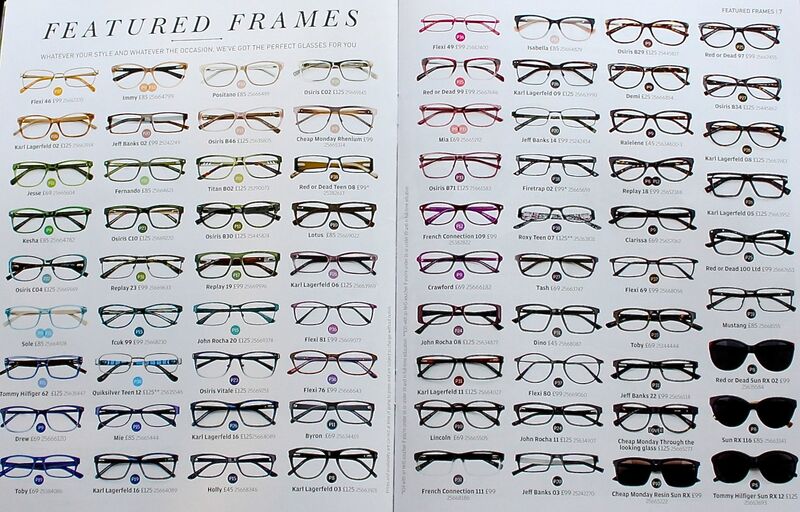 So I mentioned that to the assistant and he was very thorough in finding all the frames in the shape I wanted. In the end, I was between three frames: two from Osiris and a Karen Millen – two involving leopard print – and ended up settling for the gorgeous Osiris B39, a dark purple cat eye shaped frame. I chose that as it was the biggest shape of the three and I thing bigger frames look best on my face, which is heart shaped with not so delicate features, so the bigger frames balances it out quite well. My lenses weren’t available immediately; in some cases, they can do that for you straight away, which is great! My non-reflective lenses took only a couple days to be put on my chosen frame and upon collection the service was impeccable – quick, friendly, attentive, even though the shop was full. I had a little adjustment to the legs, which got done pretty quickly, and the assistant told me I could take them to any shop to have any others done after I wear them for a bit – which I did for a small adjustment to the nose bridge. It is great to count with some after purchase service!!! So, I am in love with my frames and really impressed with the overall service received at Specsavers – a great start to this intimate relationship, I am sure me and my specs are going to be happily ever after. To check the Osiris range and the extensive glasses, sunglasses and contact lenses offers, check the Specsavers website. This post contains PR samples. This review, however, is based on my own true experience with the product and reflects my honest opinion.